This slightly risqué old English song about lads and lasses getting frolicksome is one of my favourites (listen here) and brings back happy memories. Once upon a time I would be looking forward to warmer days, watery sunshine, Spring flowers, walking in the countryside and the promise of Summer. Here in Dubai I’m clinging desperately to the last hint of freshness in the air as the daytime temperatures start to climb. I have to walk the dogs at 6am as an hour later they start to pant and look forlorn. I certainly want to eat lighter food and spend less time by a hot oven too. What’s in my kitchen this month reflects this plus I’m still benefitting from the lovely goodies from last month’s workshop. Sandwiches top of the things I want for lunch. I’m presently addicted to a walnut loaf which has red wine in it from the brilliant book Short and Sweet by the equally brilliant Dan Lepard. Otherwise I buy a loaf from Baker & Spice. Kind Meeta brought a jar of Leberwurst – a type of pâté that her part of Germany is particularly famed for – and I’ve worked my way through it single-handedly, paired with cornichons and fresh tomatoes. And tomatoes are the best thing to buy from the farmers’ market right now. Chopped and dressed with a little really good olive oil (I use the grassy-flavoured one from Giorgio Locatelli’s own olive grove in Sicily available at Atlantis), a tiny splash of sherry vinegar and some sea salt and black pepper, I stir them into pasta or scoop them onto bruschetta or just a lovely fresh piece of bread. I was lucky enough to go to the launch of the new tapas area within Lafayette Gourmet this week. It’s called Tapeo, the chefs are Spanish and they do a simple, authentic and very tasty paella among other things. It’s the first time that I’ve had a piece of cheese and a Seville orange in a goodie bag – and I’m not complaining. I presume the cheese is manchego or something similar. 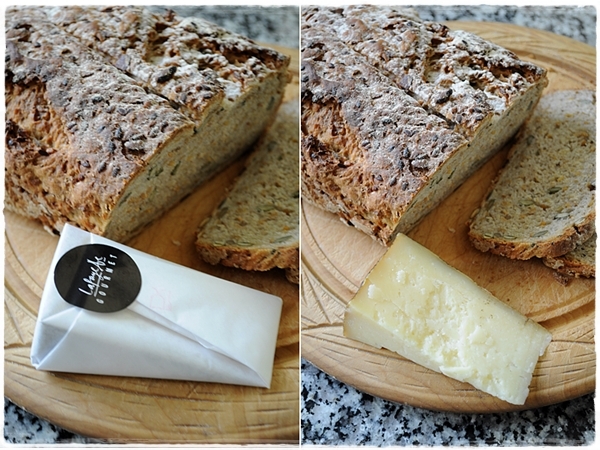 It’s tangy and crumbly and goes really well on multigrain and honey bread (Short and Sweet again) with some membrillo (quince paste). 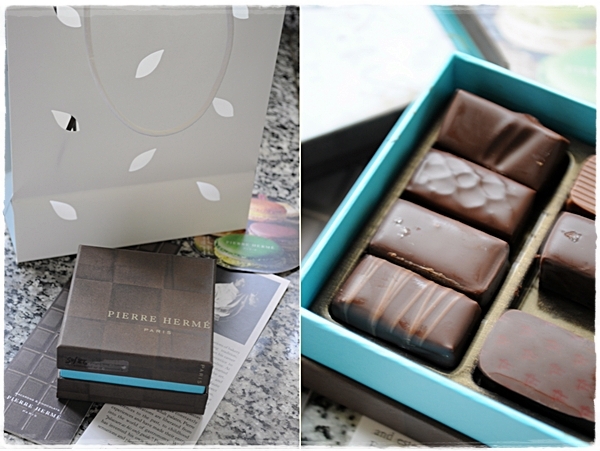 The Pierre Hermé chocolates almost don’t qualify as they were in my kitchen for such a short space of time. They had gorgeous ganache-style centres with intense flavours such as ginger and salted butter caramel . I’m very good at having a small amount of chocolate and making it last a long time. Sadly the rest of the family don’t share my puritanical eking out. We had a huge bag of Lindt Neapolitans this month too which disappeared before I managed to eat a single one (let alone take a picture). It’s GCSE time in our house (major exams) which I think accounts for the rise in chocolate consumption. A combination of the heat and me opening the box upside down mean they look a bit bashed – but they tasted amazing. Hope you enjoyed the peep into my kitchen this month. As aways this foodie voyeurism is inspired by Celia of Fig Jam and Lime Cordial. Perhaps I should have called this ‘bread in my kitchen’! What’s in yours this May? Gorgeous food! That bread looks wonderful. What great flavors. Oh shame…hopefully it’ll be a gorgeous summer. 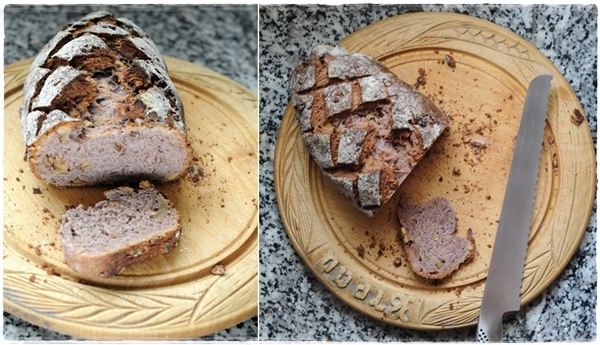 I do like the look of that bread…It’s on my list, although I might find an alternative to the walnuts. 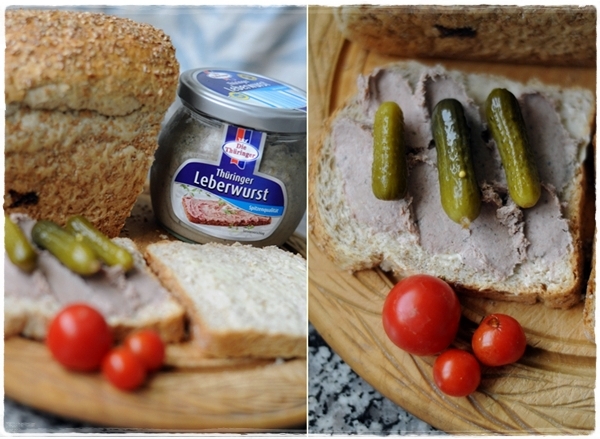 Pate and pickles….yum. 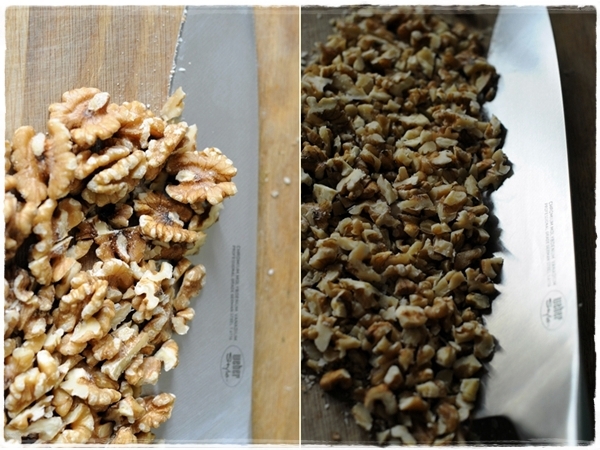 The walnuts are really very good – brazil nuts? Hi sally.. Love your choices. Bread, spread and pickle… with tomatoes.. yum. by the way I am attending the coffee course you did last month,, this saturday.. I hope. Fantastic – I hope you enjoy the course as much as I did. We get through rather a lot of them in our house Silvia…pickle-mad! 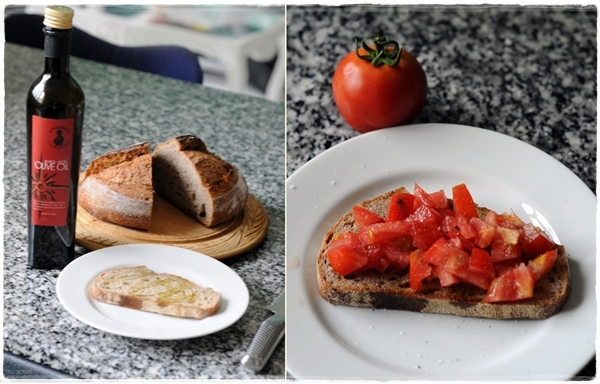 Only you, Sally, can make a simple tomato sound as delicious as you do…. another mouthwatering post of culinary delight. Thank you! Ah thank you Tara – but to me a simple tomato…if it’s a fresh, ripe, vine tomato picked that morning….is the ultimate in mouth-watering. What wonderful delights you have in your kitchen Sally. I’m working my way through and loving every recipe. What fun to peek i8nto your kitchen. I love the happy tone of the post–makes me want to frolic in my kitchen. I think we should all frolic more…forget follow Friday on Twitter, let’s frolic instead. 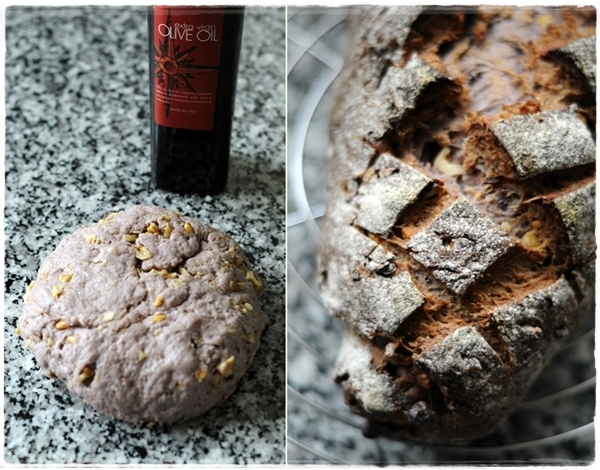 What a lovely post and that bread, oh my, you inspired me to try baking a bread. Must seek for that Short and Sweet book. Shame on me, if I am not finally opening the perfect olive oil bottle I have kept waiting for home made bruschetta. Oooh you’ve got to open it Minna – it’s fresher than olive oil from the North of Italy, it tastes as it looks…bright green. The loaves look so good. We used to buy the same leberwurst when we were in Frankfurt – do you think we get it here somewhere? Oh your posts are so lovely! What an incredibly nice comment. Thank you. I’m with you there, summer has me craving light fresh flavours and I love the ones you’ve showcased in your kitchen. I’m leaving this post wondering if I should just go out and buy some ingredients for a nice lemony tabbouleh, with some multigrain bread on the side…wish I could bake bread that looks as professional as you do! Such delicious things in your kitchen! Love the loaves! I love the peep into your kitchen and good luck for the exams! Lovely looking loaves. How do you get on with Dan Lepard’s curious (to my eyes) kneading technique? Do you think it’s better than more conventional kneading, or even than my favourite working the dough (after Mr Bertinet)? If you give like it, I might well give it a try! That last comment of mine should have read “If you like it…” Doh! Oh yeah that leberwurst is awesome. Glad you like it. Try spreading a thin layer of mustard before you add the cornichons on them … adds another flavor level. So miss you! That was me — Meeta … M!! Must give that bread a go-mmm-adding red wine to the dough-that will be a first. Hope that means I can still have a glass with it once it is baked!! It’s always such fun having a peek inside other’s kitchens and yours is no exception. The thought of all that heat has me wilting at the very idea – I’ve been finding it hard enough coping with the mini heat wave we’ve just been experiencing in Cornwall. As for chocolate, I used to be renowned for eking out my rations. But these days, if I don’t get through it quickly (or hide it) it’s gone before I get a chance. That heat wave will have gone by July when I’m there! KP will hoover up any chocolate in our house – but only if it’s milk.